Arriving at Diera, walking past Chop Chop Square and towards the souk. I have always liked the idea of a day’s outing. We knew that somewhere in the area was a gold souk. We also knew that there would be pashminas for sale. There would also be a lot of other stuff that none of us would ever want to darken the doors of our homes with. We went prepared. 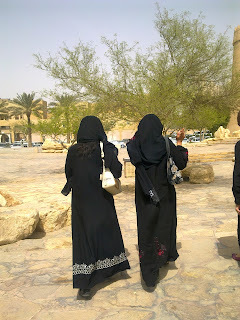 As well as the mandatory head-to-toe black, we also wore headscarves. The muttawa (religious police) had headquarters nearby and we were, after all, five western women on our own. In Riyadh it pays to be careful. As we travelled I looked at the bustle of traffic outside. It was chaotic as always, with cars weaving in and out of lanes, and impatient honking at intersections. All hares and no tortoises, I thought to myself. Approaching Deira, the roads became narrower and the buildings either side changed from high-tech high-rise to shop houses and crumbling old buildings made of mud plaster, all the colour of the desert. 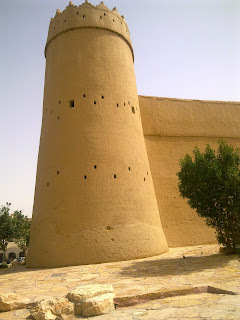 Our driver stopped in a parking lot adjacent to Al Musmak Castle. Once a fortified citadel this is nowadays a museum open to the public. I should explain more carefully the phrase “open to the public” because entry here, as elsewhere in Riyadh, is segregated. Men form one distinct group; while families (which would have included us) form the other. While men could visit any day of the week, the only day allotted for us to visit is Thursday. No equality of opportunity here. Someone once wrote that women in Saudi are third class citizens – with men at first place, and their cars at second. Beside Al Musmak was Chop Chop Square, so named for the public executions which take place weekly. One of our group, Tina, told us there was a tiled area with drainage underneath in the centre of the square. This, she explained pragmatically, allowed the blood to drain away, as well as the water which was used to sluice down the area after an execution. This was far more information than I needed and I suddenly felt very squeamish. The gold souk was a timely diversion. With relief we turned our backs on Chop Chop Square and wandered down its narrow alleyways and small open shops with their arrays of gold, diamonds and jewels. We were on the look-out for mustafa. Susie explained that if wealthy Saudi women received Western jewelry as gifts they often sold it, preferring the Saudi brighter yellow 22 carat gold. Such 'gifted jewellery' could include Cartier, Tiffany, DeBeers and was generally kept in a box behind the counter. It was known as mustafa, probably meaning used. Susie assured us that there were amazing finds to be discovered in a jeweler's mustafa box, and that she had herself just recently bought a beautiful Cartier necklace for a fraction of what it was worth. However, today there were no such prizes to be had. Secretly I was quite glad. I didn't need the temptation. From gold we moved onto pashminas. We discovered that the finest woolen of these were called shahtoosh made from the fur of the Tibetan antelope. To demonstrate just how fine, the shopkeeper took my ring and showed us all how the entire shawl could pass through its small circumference. Intrigued by all this, I later googled shatoosh. The shop keeper was right. However, what he neglected to tell us was that the antelope is now an endangered species. It’s been almost hunted to extinction for its fur. The buying and owning of shatoosh is illegal in many countries. Don’t think I’ll be buying one any time soon. Sounds like you avoided temptation rather well and for all the right reasons. I imagine that shahtoosh would be fairly expensive!